Dungeness crab season starts in San Francisco in November and runs through the winter. We get our live crabs straight from the wharf. Most Chinese seafood markets will have live Dungeness crabs, even outside the normal season. Serve the cooked, cracked crabs with a good Chardonnay and warm sourdough bread. We serve one small (1 1/2 lbs.) crab per person; this recipe serves four. Keep your live crabs refrigerated or on ice right up until boiling them, which keeps them fresh and also numbs them, minimizing any pain they might feel. Over high heat, bring the water to a rolling boil in the pot. Stir in crab boil spices and salt. Add the live crabs to the pot and bring the water back to a boil. Cook for 20 minutes at a rolling boil. When they have finished cooking, reduce the water to a simmer. Remove the crabs with tongs or a strainer with a handle and run briefly under cold running water until cool enough to handle. Remove to a cutting board. Remove the claws and legs by twisting and pulling gently from the body. Place in a metal strainer. Remove the top shell of the crab by holding the bottom of the crab in one hand and pulling at the base of the top shell with your other hand (use your thumb to get under the shell). Some people like the greenish "crab butter" in the top shell; if you don't or aren't sure, don't bother keeping the top shell. 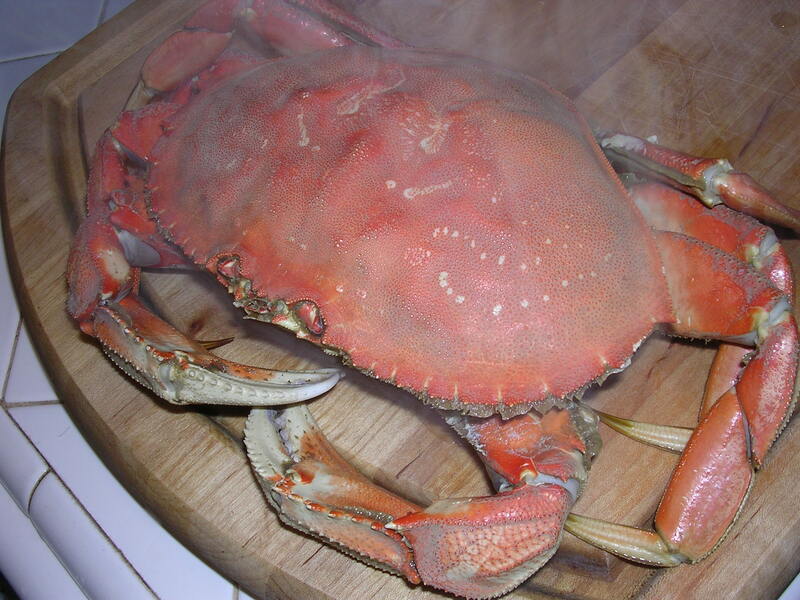 The bottom portion of the crab contains excellent meat. Pull off and discard the long gill filaments. Rinse under cold water and cut into quarter with a sharp knife. Place these pieces with the claws and legs in the metal strainer. Submerge the strainer for a few moments in the simmering water. Strain and serve with a crab cracker, a thin crab "fork" or pick, lots of napkins, and any fixings you want.